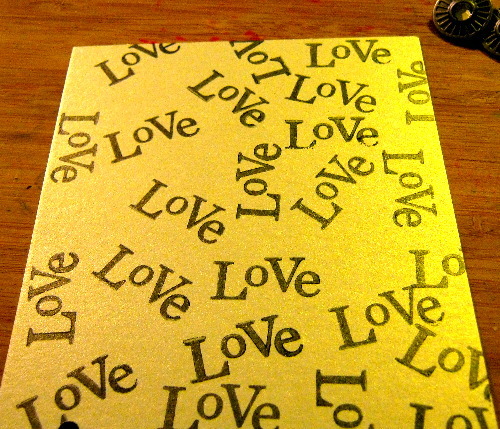 Posted on April 5, 2010 by Albert G.
Today’s card project is rather simple in construction and execution. And yet, it manages to be a statement maker and an eyecatcher. Sometimes, a simple idea executed well can give you unexpected results. I’m not sure if this is going to carry off well in photographs, but this card is quite elegant in person. My main objective when starting this project was to use a piece of printed transparency on a card design. The piece I used comes from a 12″ x 12″ transparency sheet from Creative Imaginations. The design is from the fabulous Marah Johnson, whose work I adore. If you love hip, tattoo-inspired artwork, I highly recommend you check out Marah Johnson’s work. 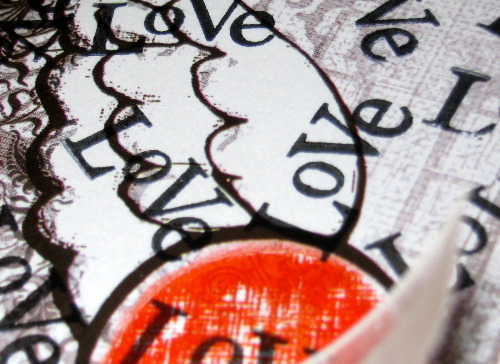 The piece of transparency I used was 4″ x 5 1/4″ and comes from Ms. Johnson’s “Lovestruck” collection. The main challenge when working with transparencies–and clear elements, in general–is figuring out a way to adhere the piece to your project. Being a transparent material, unfortunately, many adhesive solutions will show through the piece and create a less-than-desirable look to a finished project. 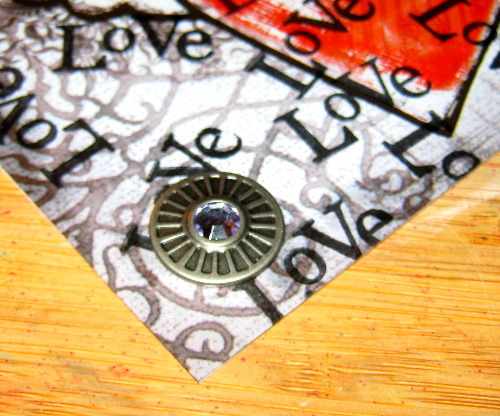 Most of the time, it then becomes a challenge to hide the adhesive with embellishments (without trying to be too obvious that is exactly what you are doing. I think many people shy away from transparency film for this very reason. In the past, I’ve tried “hiding” adhesive and never been happy with the results on the whole. 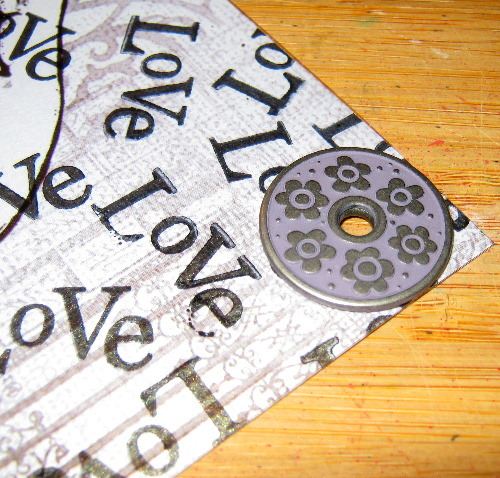 One day, I tried to use eyelets to adhere the transparency to a project–and it does work better. However, the problem with eyelets is that you have to be extremely careful when setting them at just the correct separations so that the transparency film does not buckle or pull creating unsightly bumps and wrinkles on your overlay piece. I quickly realized that instead of trying to use eyelets in all corners of a transparency–less is generally more. If you can use two opposite corners in your design planning, you are able to properly attach the overlay to your project and still allow the transparency some movement and air to breath. 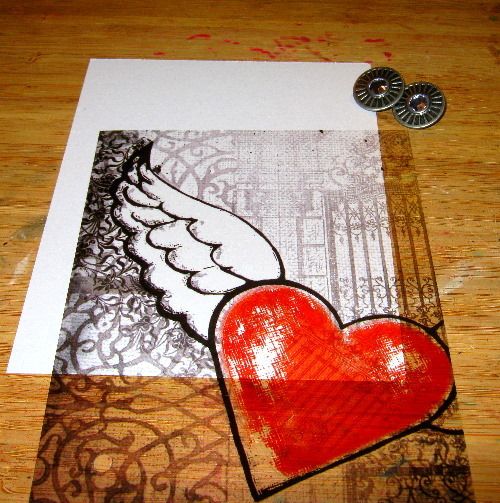 In the past, I’ve stamped images on plain transparency film you can buy at Office Depot or other office supply stores. Your best bet as far as inks go has to be StazOn–as it tends to smear less and dry very quickly. Occasionally, I’ll find a piece of pre-printed transparency that I’ll fall in love with and “have” to buy. The problem with most preprinted transparencies is that they can be quite expensive. 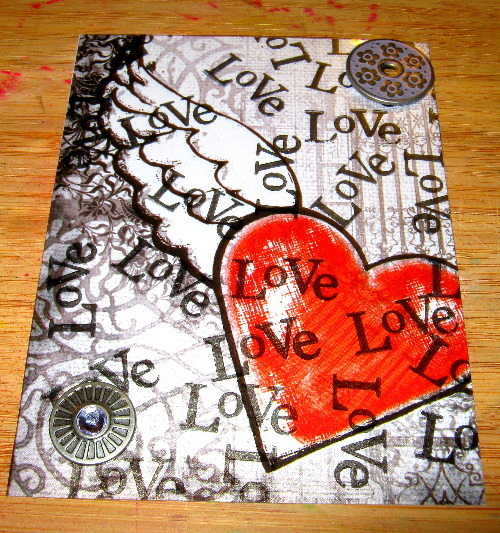 So, don’t be afraid to attempt to make your own with some of your favorite stamps and colors. There may be some trial and error involved, but the results are really worth the effort in the looks you can achieve. I decided to mount my transparency to a piece of Stardream Fuse Mica cardstock in a color called Quartz. It has a nice icy sheen to it. 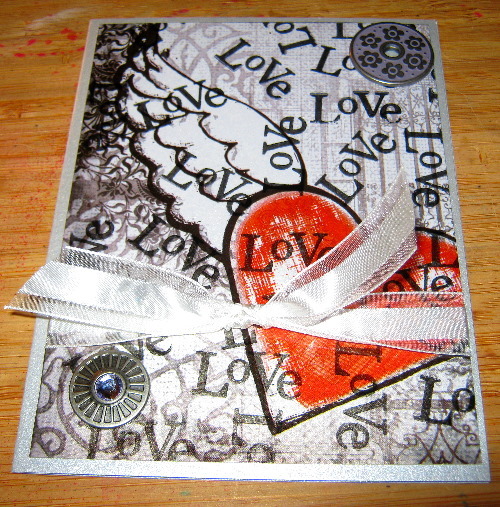 (TIP: Several readers have asked about where I buy my Stardream Fuse Mica cardstock from. While there are several sources you can find on the Internet, I shop with California Paper Goods. They have the best selection and offer a wide array of sizes, quantities, and styles (not too mention great pricing). Their packaging is impeccable and they are very quick in turnaround.) My cardstock base is the same size as the transparency, 4″ x 5 1/4″. I quickly realized that I did not want to just attach the transparency directly to the cardstock (even though it looked perfectly fine). 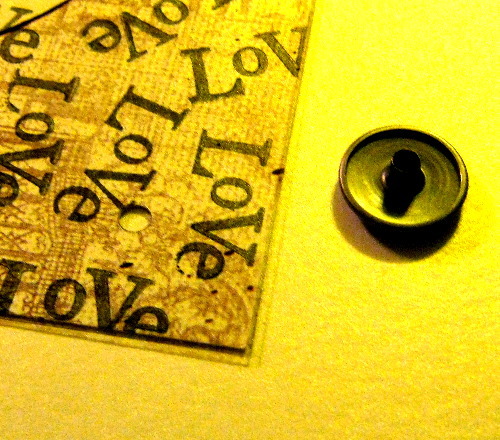 I rooted around in my stamps and found a sentiment stamp from Papertrey Ink’s “Mega Mixed Messages” collection and used some Jet Black StazOn ink to stamp the word “love” haphazardly (well, it supposed to look haphazard but takes some work) on the Quartz cardstock. A few seconds to dry and I was ready for my gromlets (but, I think they were not ready for me). Aligning the transparency with the cardstock, I used the Crop-A-Dile to punch a hole through the layers to insert the gromlet through. The first one was a snap. The second one was more like crackle. Apparently, I applied to much pressure when setting the gromlet and the crystal stone in the center of the gromlet shattered. It stayed together, but I really could get past the cracked look of the crystal and had to abandon that gromlet for another. While they certainly don’t match, I think they work well enough together on this particular card. I then took another piece of the Stardream Fuse cardstock in the same color (5 1/2″ x 8 1/2″, scored at 4 1/4″) to create the card base to attach my “gromletted” piece to. 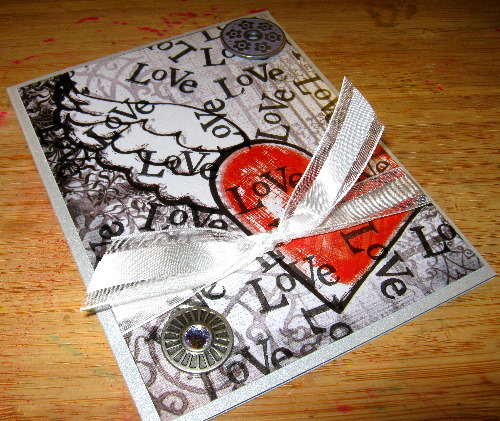 A piece of Stampin’ Up! 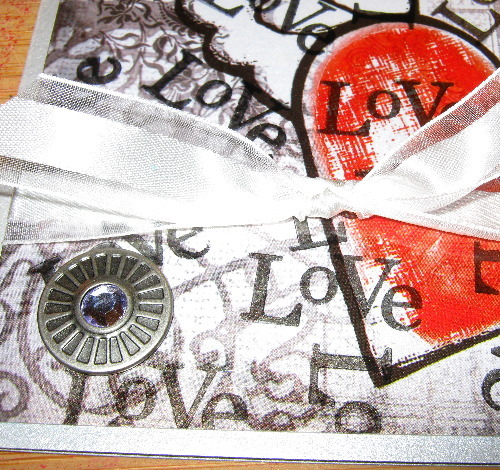 5/8″ satin ribbon in Whisper White made a lovely finishing touch. 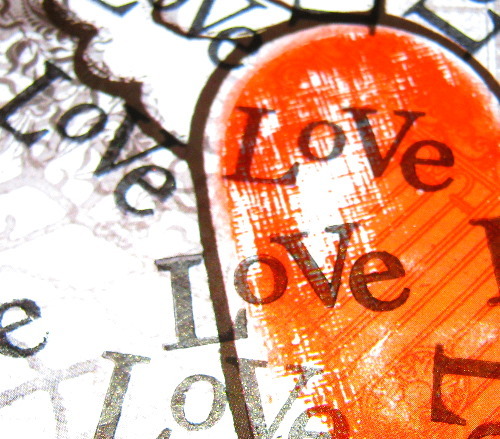 Well, I hope wherever today takes you or finds you, you’ll be surrounded by love. There’s too much hate in the World. So do something kind for a perfect stranger. It’ll do both of you good. Feed your soul….and as always, keep crafting!